They all look the same to us. Celebrities, that is. And by us, I mean academics. The proof starts with peacocks. Last fall, I was working on some measurements I took of the crest ornament in these birds. Peafowl have this funky little fan of feathers on top of their heads, and though it’s not that small in the grand scheme of fancy bird plumage ornaments, the peacock’s five centimetre crest looks a bit ridiculous next to the metre-and-a-half long train. 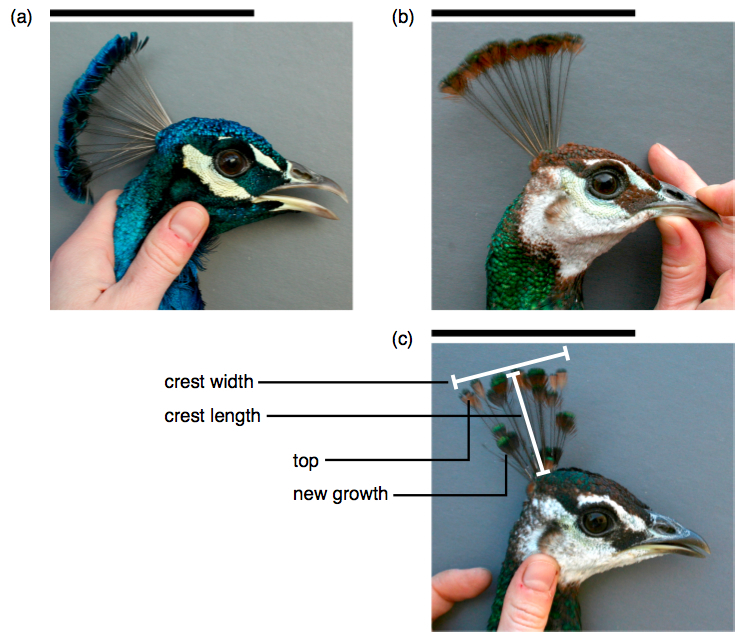 Crests of (a) male and (b-c) female peafowl. Scale bars are 10 cm. Photos by Roslyn Dakin. Over the years, I’ve measured the crests of close to 150 birds. These data lend some support to the idea that the crest is a signal of health in both males and females, although it might work in slightly different ways for the two sexes1. As you can see from the picture above, there is a lot of variation in how the crests look – and it’s mostly on the female side of the equation. Almost all adult males have tidy looking crests like the one shown in (a), but females often have crests with a lot of new feathers growing in (c). It turns out that males in better condition tend to have fuller, wider crests. The healthiest females, on the other hand, have crests that look most like those of males, with all feathers grown out to the top level (b). The extreme variability among females leads to an additional hypothesis, and it’s one that I can’t rule out at this time. Perhaps the crest is a signal of individual identity that the birds use to sort out who’s who in their social groups – just as faces do for us. A clue that this could potentially work for peahens is that my field assistants and I can do it. Once you spend enough time hanging around with these birds, you find yourself recognizing certain females that haven’t been captured yet (and that therefore lack identifying leg bands). Your first clue? Usually a unique pattern of crest feathers. So peafowl don’t all look the same, provided you know what to look for. This sort of identity signalling goes on in many other species, sometimes to a remarkable degree; especially in cases where animals have to locate family members in a large group2. King penguin chicks in Antarctic colonies of thousands can pick out the individual vocalizations of their parents3; emperor penguins similarly use vocal cues to find their mate in the huddled masses without the help of any navigational landmarks4. Fur seals, also breeding in large colonies in Antarctica, do something similar as pups use vocal cues to find their mothers5 – and so do Mexican free-tailed bats, only they do it in caves shared with millions of neighbours6 . Seabirds breeding in dense colonies often have eggs with colours and patterns so variable they look like Easter decorations – allowing parents to locate their own offspring in a crowd7,8. In species where competition and aggression are fierce, the ability to recognize a particular rival can also be an advantage2. American lobsters and rainbow trout can distinguish individuals that they have sparred with in the past9,10. 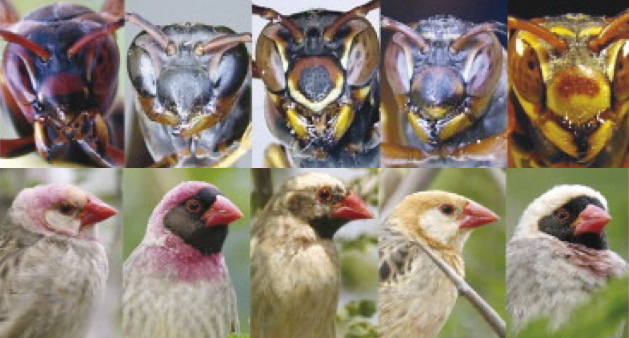 Even insects like paper wasps and ants are able recognize other individuals in a dominance hierarchy, using unique visual and chemical cues11,12. Elizabeth Tibbetts and James Dale wrote a nice review of animal identity signals that I was reading for my crest project2. Tibbetts was the first to show that insects can use visual signals for individual recognition, using paper wasps. This species has highly variable face colour patterns. Elizabeth Tibbetts painstakingly altered wasp faces with modeler’s paint (see painted faces of a related wasp), in an experiment confirming their ability to use these cues to tell one another apart11. James Dale works on the red-billed quelea of Africa. The world’s most abundant bird, with million-strong flocks that can decimate an entire wheat field, quelea display a wide range of plumage colours from yellow to deep red. They also have different patterns of face colouration, and James Dale thinks that patchy colours might function as identity signals in this species as well13. What does this have to do with celebrities? Well, in their review, Tibbetts and Dale have some pictures of potential identity signals in different animals. All of the following images can be found in Figure 1 in their paper2. And then they mess up those very faces! Costner, Quaid and Swayze are labeled correctly in the figure caption, but the authors confuse Kiefer Sutherland for Matt Damon, and Kevin Bacon for David Beckham, to boot. Is this proof that productive scientists don’t have time for cheap entertainment? Or could Tibbetts and Dale suffer from face blindness, the peculiar condition where humans lose the ability to recognize faces, despite being perfectly good at recognizing other objects? Face blindness is often caused by damage to a particular region of the brain in the fusiform gyrus, but it can also be inherited, and many people suffer from a range of mild face recognition impairments14. As Tibbetts and Dale point out in their review, face blindness in humans is a consequence of our remarkable specialization when it comes to processing faces2. Because we devote a specific region of our brains to the task, it is possible to lose the ability to judge faces while the rest of our minds remain more or less intact. Our impressive abilities when it comes to face recognition might also explain why we cannot (yet) design a computer program that will come anywhere near the performance of real people at this task. Perhaps the most likely explanation for the mistaken celebrities is that there were last minute photo swaps, maybe for copyright reasons, and someone forgot to adjust the caption. The journal never published a correction, so I wonder if anyone else has ever noticed. I can only hope that Kevin Bacon and the others know that they’ve made it into the scientific press – as a publicity mistake. Dakin, R. Manuscript submitted for publication. Tibbetts, E. A. and Dale, J. 2007. TREE 22: 529-537. Aubin, T. and Jouventin, P. 1998. Proceedings of the Royal Society B 265: 1665-1673. Aubin, T. et al. 2000. Proceedings of the Royal Society B 267: 1081-1087. Charrier, I. et al. 2002. Animal Behaviour 63: 543-550. Balcombe, J. P. 1990. Animal Behaviour 39: 960-966. Buckley, P. A. and Buckley, F. G. 1972. Animal Behaviour 20: 457-462. Gaston, A. J. et al. 1993. Animal Behaviour 45: 301-306. Johnsson, J. I.. 1997. Ethology 103: 267-282. Karavanich, C. and Atema, J. 1998. Animal Behaviour 56: 1553-1560. Tibbetts, E. A. 2002. Proceedings of the Royal Society B 269: 1423-1428. D’Ettorre, P. and Heinze, J. 2005. Current Biology 15: 2170-2174. Dale, J. et al. 2001. American Naturalist 158: 75-86. Gruter T. et al. 2008. Journal of Neuropsychology 2: 79-97.